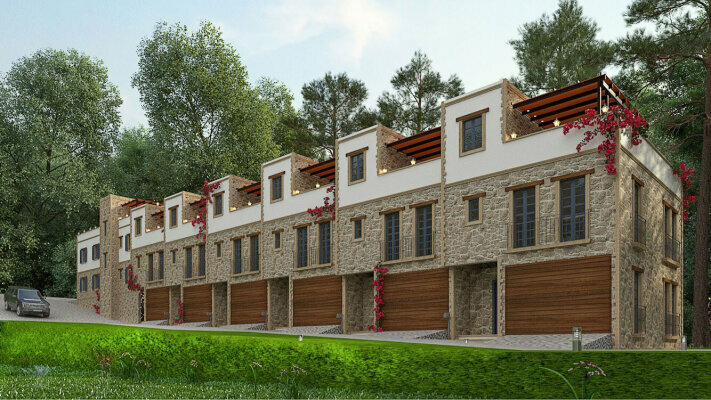 These townhouses are located in 5 minutes drive to the center of Kyrenia, in the wonderful suburbs of the city - Edremit. Kyrenia is perhaps the most developed and interesting city of Northern Cyprus. A unique old district with an atmosphere of old streets, where you can observe a beautiful sunset sitting in a cozy restaurant. The city is equipped with shopping centers, cinemas and other entertainment facilities. The best schools and universities could also be found here. This is one of the most developed regions which is also suitable for permanent residence region. The proposed town house is a beautiful project - the interpretation of classical English buildings, with typical Cypriot colors. Covered garage, spacious living room, cozy bedrooms and a wonderful view from the window. of the townhouses - is a combination of English style with the authentic Cypriot elements. The interior design provides a good use of space. is one of the aspects that many consider when choosing a house. In these townhouses, one would want to raise their children, get a pet or simply enjoy the view from the window. Fresh air that one would want to breathe in, a place for daily walks and a sea that attracts people with its clean waters.